Indian citizens or people of Indian origin residing outside of India, temporarily or permanently, can hold different statuses that reflect their ties to the home country. These are especially important for taxation and immigration related needs, since the regulations and requirements differ based on the status they hold. In general and non-specific terms, any Indian citizen who does not live in India is a non-resident Indian. he/she did not reside in India for more than 182 days during the preceding financial year. he/she did not reside in India for more than 60 days during the preceding financial year and for more than 365 days during the four year period prior to the preceding financial year. He / she is in India in that year for 182 days or more (irrespective of whether the stay is a continuous period of 182 days or in multiple parts). 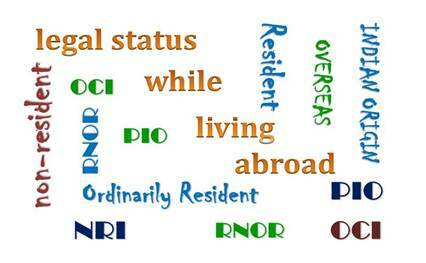 Person of Indian Origin (PIO) is defined as any person who presently is a citizen of another country (i.e. he/she holds a foreign passport) but who was an Indian national by lieu of holding an Indian Passport at any time or whose any of ancestors was an Indian national. Such a person may be eligible to apply for a PIO card. Please see our PIO Card page. The Overseas Citizenship of India (OCI) Scheme, which was introduced by amending the Citizenship Act, 1955, provides for registration as Overseas Citizen of India (OCI). All persons of Indian origin (PIOs) who were citizens of India on 26th January, 1950 or thereafter or who were eligible to become citizens of India on 26th January, 1950 are eligible for registration as an OCI. This does not include persons who are or had been a citizen of Pakistan, Bangladesh or such other country as specified by the Central Government. Please see our OCI Card page. A resident Indian is required by law to pay taxes on all income in India and overseas. RNORs do not have to pay tax in India on their foreign income. 401K Withdrawl: The best time for 401K withdrawl could be during the period when one is RNOR since they would not have to pay tax on the 401K money in India and they may have to pay relatively lower tax in US as well if they do not have other income in US as RNOR.